By buying this product you can collect up to 310 points . Your cart will total 310 points that can be converted into a voucher of ₱310 . Dual-channel H.265/H.264 4K video transcoding on the fly. 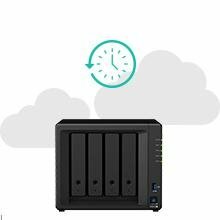 The DS918+ integrates the Btrfs file system, delivering the most advanced storage technology to meet the management needs of small businesses. DiskStation allows you to transcode H.265/H.264 4K videos to 1080p and stream them to high-definition TVs, digital media players, mobile handsets, and computers in the required format, making it easy to watch your entire multimedia library without having to install a 3rd party player. 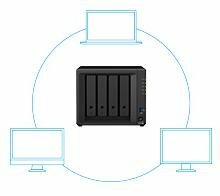 Maintain control of your data and ensure your files are safe with Synology. We provide secure, reliable, and affordable solutions that make it easy to backup files for all your devices and protect yourself from accidental data loss. Surveillance Station delivers intelligent monitoring and video management tools such as managing multiple IP cameras with live streaming, integration of I/O modules and more to help safeguard all the important places in your life. Access your files anywhere, any time, over the Internet without the hassle of setting up port forwarding rules, DDNS, or other complicated network settings. QuickConnect allows you to connect via a simple customizable address so that you can instantly access media and work files on any Windows/Mac/Linux computer, laptop, or mobile device without additional charge. The DS918+ is more than just storage, featuring a suite of add-on applications via Synology Package Center. With 90+ apps to choose from, you can transform your Synology NAS into an all-in-one server, cloud syncing host, multimedia hub, and much more. DiskStation offers an arsenal of security enhancements and tools to safeguard your data from malicious or snooping parties. You can block threats with the firewall, auto-blocking, and more. Audit configurations, detect weak passwords, and ensure the system remains free of vulnerabilities with the built-in Security Advisor. Lock down data storage and network communication with sophisticated AES encryption and SSL certification/Let’s Encrypt tools. With the support of Windows AD, LDAP, and Domain Trust, DS918+ enables seamless account integration. Windows ACL support allows admins to fine-tune access controls and set up privileges to files and folders. For larger deployments, the Central Management System (CMS) application delivers a single-pane-of-glass admin console, where you can batch manage multiple Synology products by automating tasks and setting up policies.